B&B Pet Stop GIVES BACK! B&B Pet Stop GIVES BACK! 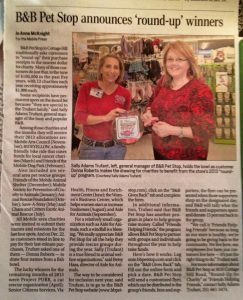 Mobilians have been shopping here at B&B Pet Stop since 1981, and we consider it an honor to GIVE BACK to our community. We’re proud to support LOCAL organizations helping LOCAL people. Thank you, Mobile – we love you, too! Most Wednesday mornings, we have groups of school children from our community come through the store. We present a half hour educational program (geared to younger children) that includes the opportunity to touch many of the animals. Every child gets a free coloring book. Field trips are also open to day care centers, church groups, and scouting groups. Field trips are free of charge and available year round. To schedule a field trip for your group, simply complete this form. We give away thousands “free goldfish coupons” every year to schools, church groups, and community sports teams to use as favors, rewards, or prizes at festivals. To request “free goldfish coupons” for your organization, simply complete this form. We will happily give your organization money when you send your friends in to shop! Here’s how it works: You fill out the online form and pick a date – we send a customized flyer to you – you distribute the flyer to your friends, fans, and supporters in our community – they bring the flyer with them (or show us the flyer on their phone) when they shop on the designated day – we tally up what your friends spend that day and donate 15% back to your organization. Just friends helping friends. Click here for a list of Frequently Asked Questions. To be considered for inclusion, simply complete this form.